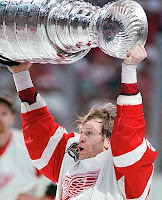 On June 13th in 1997, heartbreak hit Hockeytown when a limousine carrying two members of the Russian Five and the Detroit Red Wings masseuse struck a tree six days after their first Cup win in 42 years. The crash left Vladimir Konstantinov and Sergei Mnatsakanov in a coma with severe head injuries. Both eventually awoke, Konstantinov suffering extensive brain and bodily damage and Mnatsakanov paralyzed from the waist down. The Vladinator would never play hockey again. Slava Fetisov walked away unscathed. 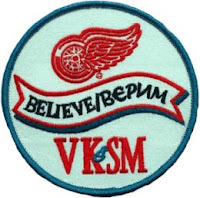 Bearing badges embroidered "Believe" the Wings repeated as Stanley Cup champions, engraving Konstantinov's name despite his on-ice absence. Though not officially retired, no player has worn his number 16 since the injury. His locker remains intact. Driver Richard Gnida was sentenced to nine months for operating the vehicle with a suspended license and testing positive for marijuana.